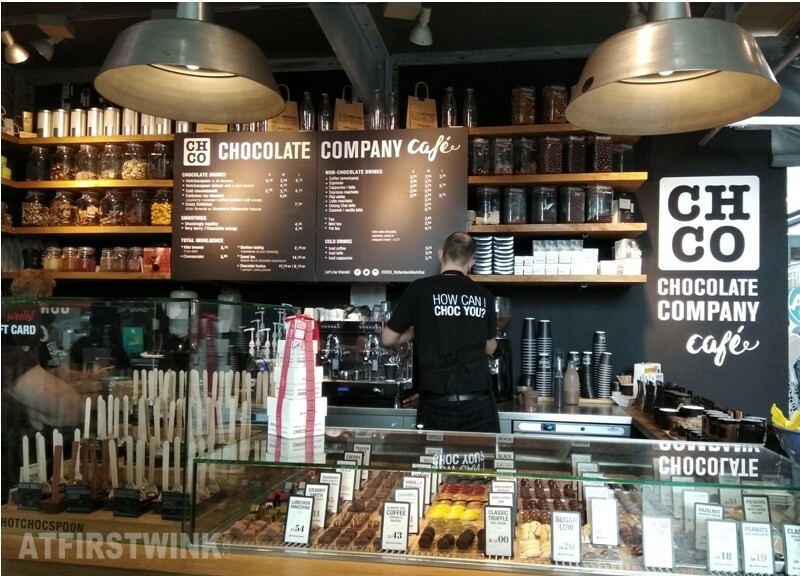 The Markthal in Rotterdam not only has a Jamie's Italian, Royal Fish (where you can get delicious fried fish), De IJssalon ice cream parlor, Kroket loket (for special Dutch croquettes), and a Momade cupcakes store, but also a Chocolate Company Café. I know Chocolate Company from their famous HotChocSpoons, which are basically wooden spoons with a cube of chocolate attached to them. You can create your own hot chocolate by stirring them in a cup of warm milk. 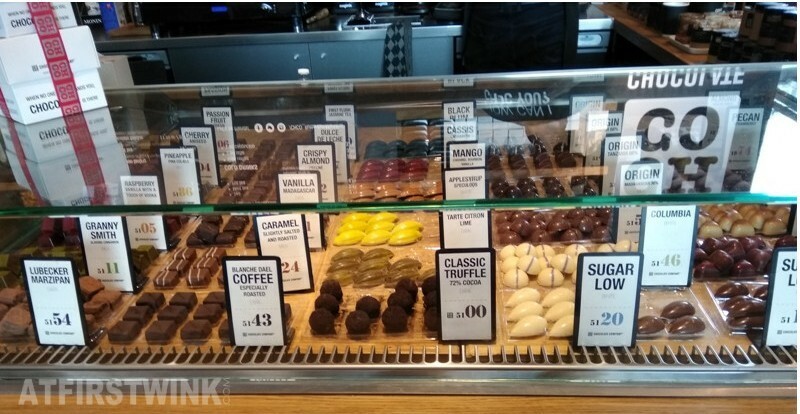 It sounds like it is something that you can also make at home by filling ice cube molds with chocolate and sticking popsicle sticks in them, but they use high quality chocolate and there are more than 60 kinds of chocolate flavors for you to choose from. Some notable flavors are: Gin-Lemon (with a mini syringe of gin attached to the chocolate cube), Belgian Cookie (speculoos flavored white chocolate with a cinnamon stick instead of a spoon), Banana Wasabi (banana milk chocolate with hint of wasabi), Blueberry Honey Roasted Thyme (strange combination of flavors, but it could work), Black Forest/Schwarzwalder (fruity dark chocolate with Schwarzwalder cherries), and After 8 (dark chocolate with a hint of mint). The HotChocSpoons and chocolate bonbons looked really delicious. But I went there during the summer, so I got a Cold Choc - ice blended drink instead. That time, there was a Social Deal, so I was able to get two Cold Chocs for a discounted price. Out of the five flavors (Raspberry, Caramel, Coffee, Praliné, and Chili orange), we choose Praliné (left) and Caramel (right). It isn't "you had me at first wink" (my blog's slogan), but "you had me at cool drink". The Praliné flavored Cold Choc had clear chocolate swirls that were visible from the outside of the cup, but I got feedback that it tasted like a regular cold chocolate milk. The Caramel flavored Cold Choc also tasted like a normal iced chocolate milk drink like a Frappuccino from Starbucks (albeit with a very rich chocolate flavor). Only near the end of the drink, did I find some solidified swirls of caramel on the bottom. I think we both had to shake or stir the drink a bit more, before we drank it. That way, the difference between our drinks would have been more noticeable. The chocolate praliné swirls on the inside of the cup would have been absorbed in the drink more and the chewy caramel mini swirls could have been tasted in every sip. I understand how tricky it is to get the perfect balance between the drink and the ice. It has for example often gone wrong with the Frappuccinos that I ordered at Starbucks. Sometimes, the ice would have melted too much and you couldn't even find any ice anymore or it would be too icy and there wouldn't be enough liquid to drink immediately. The Cold Choc with Caramel flavor that I got had rice shaped, lumpy bits of ice and chocolate chips in it and the consistency wasn't like the perfect Frappuccino that I once had at Amsterdam Central Station that had equal amount of crunchy ice and chocolate chips and a rich chocolate flavor. Near the end, the caramel also clogged up my straw, so I finished the drink with some difficulty. Tip: carefully blow the straw at the empty space in the upper part of the cup and it should be able to de-clog. 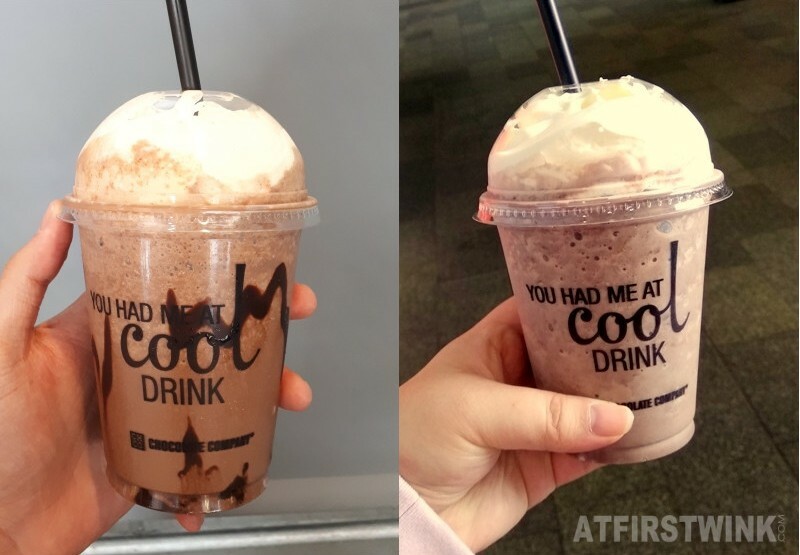 In short: The Cold Choc drinks had a richer chocolate flavor than the Frappuccinos from the Starbucks, but just like at the Starbucks, due to various variables, it might not have the perfect consistency.